Questa esperienza mescola una visita guidata con un sacco di tempo libero da esplorare a vostro piacimento. Inizia la tua visita al mattino presso la stazione centrale di Monaco, dove incontrerai la tua guida e salirai a bordo di un treno per il giro panoramico di 2 ore fino a Salisburgo. Mentre corri, goditi la meraviglia del sistema ferroviario tedesco, rinomato per il servizio e l'attrezzatura immacolata. Arriverete a Salisburgo entro metà mattina e la presentazione inizierà con un tour a piedi di 1,5 ore. Con la mappa della città in mano, segui la guida per una passeggiata in questa città dichiarata patrimonio dell'umanità dall'UNESCO. Ammira l'architettura dell'epoca barocca e visita castelli, chiese, monasteri, splendide piazze e altro ancora. Fai domande e scatta foto lungo la strada. Dopo la tua visita guidata, interrompi il gruppo per tre ore di esplorazione indipendente. 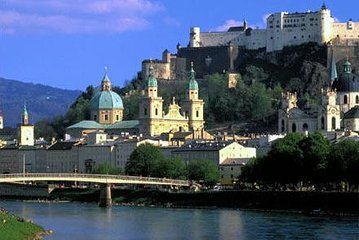 Pianifica il tuo viaggio attraverso la città medievale preservata, vagando lungo pittoresche stradine per vedere siti come la Cattedrale di Domkirche, la magnifica Festung Hohensalzburg e il Giardino e il Palazzo Mirabell, l'ambientazione per la classica scena del Do-Re-Mi da The Sound of Music ( ammissione non inclusa). Avrai tutto il tempo per visitare la città, fare un negozio di souvenir ed esplorare boutique e ristoranti locali. Alla fine del tuo tour a piedi a Salisburgo, dirigiti verso la stazione ferroviaria per il viaggio di ritorno a Monaco. Tornerai al punto di partenza la sera. We were a group of 10 (5 couples) and booked this tour on the basis that it would have been for a small group as advertised and having read on Viator's website that a small group means 8-16 people. The group comprised 32 persons(!). On a positive note, the guide was interesting and helpful. Paul was such a great tour guide—funny, friendly, and most of all very knowledgeable about the history of Munich and Salzburg! People who love history will enjoy his commentary. He also provides great recommendations for your free time. He is such a hard worker and strives to ensure that everyone enjoys the trip! This was sold as a small group tour but was actually a 32 people tour which is no way a small group tour. Sabina our tour guide was great. She knew everything and then some about Salzburg. She would recommend places to buy things and eat. Great tour. The tour guide Tom was terrific. He provided a insightful talk on the train and a quick overview of he city during a one hour walking tour. He was courteous and had a great sense of humor. He made the experience quite enjoyable. Salzburg deserves a slightly longer visit though. Would recommend staying the night. But if you only have the day this tour is perfect. Our guide was knowledgeable and gave recommendations. Group was appropriate in size and travel was seamless. Great tour and glad we had adequate free time for lunch and shopping the Christmas Market and other shops in Salzburg. Only recommendation would be to leave earlier from Munich to have more time in Salzburg. Susan was our guide. Salzburg was beautiful. Just it rained all day that it was hassle to walk around with umbrella and shop at Christmas stores. Christmas shop was really really wonderful. They had a lot of unique quality products. Great tour. Nice train ride to Salzburg. Organized and enough free time to check out the area. Would recommend if you like a small group tour. Our tour guide Maxine was excellent. She knew Salzburg and the best places to visit. Would recommend this tour. We did a day trip from Munich to Salzburg. Ian was great... super knowledgable, friendly and entertaining. He utilized time on the train to walk through the history in depth, and then gave us a big overview of Salzburg when we were there giving us plenty of free time to do what we wanted and/or spend more time in a particular site.